Women are not the only ones out there who care about what they look like, right? Men have mirrors, too; they just don’t verbalize how much they care about their appearance as much as women do. Think about the men in your life. Whether it is your husband, father, grandfather, brother, or uncle, this article is devoted to them. OK, guys, here it goes. This is what we are going to cover: your skin; what to use; how to use and how often. I promise I will make this painless and written mostly with bullet points. What is your skin type? Meaning, are you oily, dry, sensitive, or normal? Wash your face with tepid water. Wait one hour. Are you feeling dry or slick? Take a lens tissue or blotting tissue and press around face (forehead, nose, cheeks, and chin). If the tissue comes back dry, then your skin does not produce that much oil and pores are small; if it comes back oily, your pores are bigger and produce more sebum (oil). If you have medium-sized pores with smooth skin tone, you would be considered normal skin type. You may have combination skin if your face is oily in the T-zone -not a T-bone!-(forehead, nose, and chin) and dry or normal everywhere else. Very oily skin: cleanse, shave, aftershave, serum. ADVANCED SKIN CARE FOR MEN ISUN has created an exclusive, advanced skin care system just for men that includes special age-repair and restoring products for both younger and maturing male skin. The men's line is designed to care for the special needs of a man's skin and offers masculine scents that appeal to both men and women. No harsh, skin irritants are used in any of the products such as detergents, alcohol, menthol or chemical preservatives, and each product is pH balanced to optimize skin health.The clean aroma of high altitude lavender and dessert sage essential oils with an added touch of lemon tea tree oil give this hydrating gelé an antiseptic property with skin-purifying benefits perfect for a man's skin. Soothing herbs and Aloe Vera are included to keep skin calm. Refresh is low-foaming unlike high foam, high alkaline cleansing shave gels because it is pH balanced to match the slightly acidic pH of skin. Typical high alkaline cleansers and shaving products dry skin out and can be irritating, especially when shaving. Refresh ideally softens beard hair to give a smooth shave and reduce or eliminate the potential for razor burn and post-shave blemishes caused by ingrown hairs and razor bumps. After shaving, skin feels smooth and smells fresh. Directions: Step 1: Splash warm water on face, and put 3-5 pumps of Refresh in your hand, then cleanse your face and neck normally and rinse. Step 2: Shave. Ideally, use a shaving brush and shaving cup or bowl. Put 3-5 pumps of Refresh in your shaving bowl. Wet your brush with hot water and work up a low foam lather in the bowl, then apply normally to your beard. Wait 30-60 seconds then shave with the grain of the beard hair to avoid razor bumps. Rinse and dry. 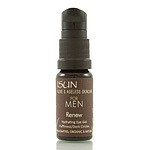 Special age-repair and restoring product for both younger and maturing male skin. Not just a high-performance, replenishing after shave skin tonic that hydrates, calms and energizes skin cells for rapid renewal, Replenish exclusively includes superconductive Ormus elements. Ormus high-spin atoms accelerate cellular communication and enhance the activity of other nutrients present. The result is increased regeneration and therapeutic benefits. In a natural aromatic base of sandalwood, neroli and lime pure distillate hydrosols, dunaleila salina algae from Hawaiian waters is added for its nourishing and protective peptides that stimulate ATP (cellular energy) increasing cell renewal. Water-binding olive-derived sodium hyaluronate and glycoaminoglycans provide excellent skin hydration. Skin irritations are calmed with a special wheatgerm extract. Replenish is excellent for all skin types. Directions: Apply 3-5 pumps of Replenish on your face and neck, including the eye area. Like our age-repair serum for women, Repair, exclusively and especially formulated for a man's skin, is enhanced with superconductive, transforming Ormus Gold. Ormus gold is a dynamic super conductor of light energy and cell communication. It may accelerate cell repair and signs of youth. The presence of ormus may also enhance the activity of the youthrestoring herbs, phytoplankton, plant-derived peptides, antioxidants and enzymes combined with stabilized vitamin C to create a truly advanced, all natural and organic skin-restoration and age preventative serum. While active regenerating and collagen-stabilizing peptides and powerful antioxidants work in harmony to reduce and prevent signs of aging, your skin is naturally protected from harmful effects from UV radiation. Lightactivated photolyase enzymes from a blue algae phytoplankton has been scientifically and clinically proven to protect cellular DNA from UV radiation as well as restore DNA damaged by UV. It also significantly revitalizes the skin's natural immune system. Together, these actions help prevent skin cancers and aging in skin. The natural UV protection is greatly increased with high levels of antioxidants such as superoxide dismutase (SOD), CoQ10 and stabilized vitamin C ester. Repair contains all of the same active ingredients as Phyto- Infusion except for two peptides that are more beneficial for female skin structure. The base of Repair is also lighter than Phyto-Infusion I & II bases to more easily penetrate male skin. Directions: Repair may be used in optional ways. (1) Apply directly to skin after cleansing or shaving. (2) Apply after first applying Replenish. (3) Mix together with Replenish and apply in a single application. (4) Mix together with Restore and apply in a single application. (4) Mix 1 pump each ofReplenish, Repair and Restore and apply all together. Be creative and discover which method works best for you. Maturing male skin that wants to stay younger looking and maximize age prevention needs an active antioxidant facial oil moisturizer that is light and easily absorbed to efficiently carry protective and regenerating nutrients deep into the skin where it makes a difference. Restore is loaded with high levels of alive, active plant antioxidants, regenerating and anti-inflammatory herbs, antioxidant enzymes and other vital skin nutrients. These are in a light, tiny molecular structure fractionated coconut oil base that is rapidly assimilated into the skin leaving no oily or greasy feeling. The fractionated coconut oil base will not clog pores and allows the skin to breathe. Restore provides natural UV protection, is soothing and leaves your skin feeling smooth and wonderful to look at and touch. The pure essential oil aroma is a unique masculine scent that women love with a sandalwood and green citrus base. Directions: Apply directly to skin after cleansing or shaving. Or apply after first applying Replenish for Men. Or mix together with Replenish and apply in a single application. (4) Mix together with ‘Restore’ (see below) and apply in a single application. Vital deep penetrating and lasting hydration for surrounding eye tissue with pure plant-source sodium hyaluronate and glycoaminoglycans is the base of this renewing eye gel. Infused with a concentrated organic herb complex, redness is calmed and skin is firmed. Organic cucumber & rose distillates are added to soothe and cool eye tissues. An Amazonian tree bark extract and plant-derived peptides help reduce puffy eyes and dark circles by stimulating lymphatic drainage and blood flow in eye tissues. This action helps to eliminate water retention that causes puffy eyes, and congestion that can cause stagnation of blood appearing as dark circles. The extracts also activate lipolysis to promote elimination of fat cells that can cause eye bags. No fillers, gelling agents or oils are used in this 100% active ingredient product.Note: 15 straight days of morning and night application are recommended to reduce or eliminate dark circles. Directions: Use only « drop of gel for each eye. Apply around eyes after cleansing as a stand-alone product, or (1) Apply after first applying Replenish; or (2) If you are using the complete Men's Care System, apply Renew after Repair and before Restore. Results : Skin eruptions and bug bites are eliminated more rapidly leaving a healthier, clearer complexion. Directions: Break-outs: After cleansing skin at night, dot breakouts with a thick application of Clarifying Spot Treatment. Allow it to dry on skin before going to sleep. Cleanse off in the morning. For best results, in the morning apply Clarifying Serum for day use. Bug Bites: It is best to treat an insect bite as soon as possible to extract and purify the injected poison. Apply a generous ‘dot’ of the treatment to the bite. Reapply after showering. Sun Protection - Use daily, preferably with a 18 SPF or higher. Plus, wear a hat and sunglasses. Be sure to get checked out by a dermatologist yearly. Eyebrow Hair – trim them and/or get them shaped. Tip: When trimming eyebrows, cut in layers so the hairs won’t stick straight out. If brows are unruly, apply castor oil with a Q-tip (be careful of eye area). This helps to soften them. So you’re ready for that big date with that special woman now. I think she will notice the difference and love it! You are special and deserve to look and feel great, too.